Woods went on to win the tournament, while Garcia had a meltdown on the 17th hole in the final round, akin to the denouement of the much underrated film, Tin Cup. The aftermath of the event led to Garcia making his feud with Woods public, declaring, "He's not my favourite guy to play with. He's not the nicest guy on tour." While all very petty and childish, if people were taking sides, it's more likely that they would initially empathise with Garcia. Woods' public image has taken a battering since the details about his private life were revealed back in 2009. In fact, it's said that the combative, slightly curt persona of Tiger in his recent Nike commercial with Rory McIlroy is the closest window we've ever had into Woods' real-life personality. However, things took an ugly turn after a recent comment from Garcia at the European Tour's gala players' awards dinner, in which he responded to a playful question about inviting Tiger to his home for dinner with the response, "We will serve fried chicken." 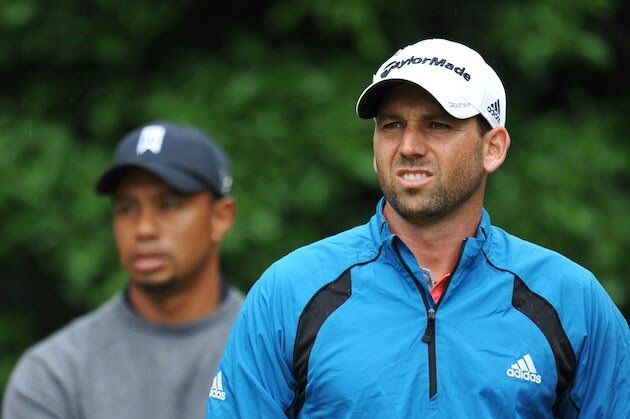 While Garcia swiftly apologised, Woods stated that he was hurt and offended by the Spaniard's comments. Things were only exacerbated by European Tour chief executive, George O'Grady who declared that no punitive measures would be taken against Garcia, with part of this statement including the following quote, "Most of Sergio's friends happen to be coloured athletes in the United States..."
Did you spot the incendiary word in that last sentence? Sadly, this isn't a rhetorical question, as many seem to be flummoxed at why Garcia's and O'Grady's comments should cause such consternation. The phrase, "political correctness gone mad" has been used on more than one occasion. Now, where have we seen something like that before? So first, a quick elucidation on what was so objectionable as per Garcia and O'Grady; To say that the food of choice to serve Woods is fried chicken ties into stereotypes related to black people, soul food, if you will. While it's not something that is restricted to any race, fried chicken is ostensibly something that "uncouth black people eat". But could Garcia's choice of bon-mot be a coincidence? Not in a month of Sundays. This isn't the only time that Woods has had to deal with micro-aggressions from his peers in regards to his race. It's oft overlooked that Tiger's success hasn't led to an increased wave of ethnic diversity in the game of golf. Bar a handful of Asian players - such as Vijay Singh, K.J. Choi, Y.E. Yang, or the sport's latest wunderkind, Guan Tianlang - golf remains primarily a white sport, with racism - as well as other forms of bigotry - an indelible part of the game for generations. Whether Woods is a person that you wouldn't lend spare change for the bus is immaterial to the wider point. Golf has a problem. It has a problem with non-whites. It has a problem with women. And that's just the cross-sections of society who are nearer the forefront than other marginalised groups. What about issues to do with sexual orientation, disability, being trans*, or not being born into an affluent background? So when racism rears its ugly visage, it's especially acute when it takes place in the world of golf. Because golf doesn't exist in a vacuum. It's not separate from the rest of the world that we live in. To borrow from Hari Kondabolu again, he tweeted about Garcia, "If Sergio Garcia is comfortable making a fried chicken joke about Tiger Woods to the press, what does he say when reporters aren't around?" And yes, lynchings, bans on interracial marriage, and incessant epithets may no longer be the norm. So instead, we get jibes about eating habits, supposed rhythm, sexual prowess, and loose fitting clothes. Racism isn't gone, it just exists in a different form. And Garcia, O'Grady, golf - and by extension, sport - isn't immune.